hey guys, I've decided to spice things up, every day after it's been 24 hr since my last post (if no one replys) i'll post some info about some trigun characters the gung ho guns. the first Gung-ho Gun to fight Vash was "Monev the gale"
Monev the gale was hired as an assassin to kill Vash. Vash's brother Knives locked Monev away in a cell for 20 years so that he could train to beat Vash. he wears a powered battle suit and carries 2 high powered chain guns on his wrists. the guns fire at an amazing speed because of the pressure chambers on Monev's back. the chain guns aren't his only weapons, besides his great height and strength, Monev also has a large minigun the he carries around, it's so strong that it can break through a safe vault, plus hidden within the minigun is a rocket launcher. after a large battle, Monev was defeated but not killed by Vash, he was then later killed by another Gung-ho Gun called "E.G. Mine" for not killing Vash. Vash almost did kill Monev, but then remembered what a friend obce told him "no one has the right to take the lives of others". with that though, Vash decided not to kill Monev. 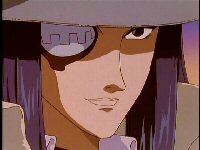 the next Gung-ho gun to face Vash was Dominique the cyclops. Dominique had the ability know as the demon's eye whaich was hidden behind a metal plate on her face. when she activates the demon's eye she causes hipnosis and sensory paralisis in her foes. this make her movements look instantaniously. this throws her foes off balance and she can kill them easily. in her fight with vash, vash defeated her by closing his eyes nd focusing on pain to numb the preseption of his senses. he was able to defeat dominique, but she ran away. she was later killed by another Gung-ho Gun, E.G. Mine. here are some pics of dominique. the 3rd Gung-ho Gun to fight Vash is E.G. Mine. E.G. Mine was only on screen for a short time, he is the one that killed the previous 2 Gung-ho Guns. E.G. Mine wears a large metal suit resembling a sphere, inside it are large metal spikes which he can launch with the help of cables attached to his fingers. he was taken down quickly by Vash and was then killed a moment later by the next Gung-ho Gun, Rai-Dei the blade. he next gung-ho gun to verse Vash was Rai-Dei the blade. unlike the rest of the gung-ho guns, Rai-Dei uses a samurai sword that can create a sonic boom when swung. if that doesn't work the blade can be shot out of the hilt and there is also a rifle hidden at the bottom of the sword's case. because Vash does not want to fight back, a man named Legato Bluesummers ativate's Vash's special power, his "angel arm" but you'll have to find out about that later. after the angel arm is activated, Vash fires it strait upwards destroying the town they werein, making a new large crater in the moon and wounds Rai-Dei after Vash dissapears, Wolfwood gets some information from Rai-Dei and then shoots him dead. this is Rai-Dei the blade. 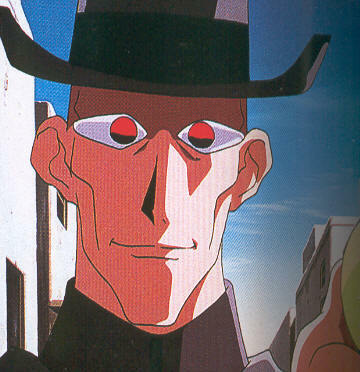 the next Gung-Ho Gun seen in the anime was Lenof the puppet master. Lenof was sent to kill vash when Vash reappeared and desided to go vist some friends. lenof can use maltiple puppets at once. most of his puppets look like humans, but some can be made to look like birds. each puppet has a microphone and a small camera in each eye, so he can hear and see what's going on. in a last ditch effort to kill Vash, Lenof descised one of his puppets as a girl that loved Vash, before the puppet shot him, one of Vash's friends got in the way and took the bullets, he died as a result. after having failed that, Lenof was killed by Wolfwood. the next Gung-ho Gun seen was "Grey the Ninelives". Grey was said to had 9 extra lives, but instead was actually a cyborg with its only human part geing his brain encased deeply within his armour. instead of fighting Vash, Grey actully fought Wolfwood at Vash's friend's place. Grey has machine guns in his fingers and rocket launchers on his chest, he was taken down by Wolfwood when woldwood shot a rocket at him. the next Gung-Ho Gun to verse Vash was Hoppered the Gauntlet. Hoppered was not able to walk, so he trained his arms so much that he is now able to wear heavy armor and carry a huge shield on his arms, he uses the shield to jump high into the air, and come down spining like a top. hidden within the shied is a machine gun and the shield it self is stronger than any metal, so Vash's gun was not able to break through it. after nearly being defeated by Vash, he decided that fighting was useless and so he through himself into the plant he was trying to destroy (I'll give info on plants later). the explosion killed him but not Vash. he next Gung-Ho Gun to appear was Zazie the Beast. Zazie is a demon that possesed a young boy. by chance, Vash and Co. just happened to visit the house of a bunch of orphanded kids, zazie was one of them. Zazie had the power to control giant worms, as big as a 5 story building (even bigger), thanks to the help of a high frequency device. when Vash found out how he was controling the worms, he destroyed the device leaving Zazie to reveal himself as a Gung-Ho Gun. Vash tried to reason with him, but before he could get through to the boy who Zazie was controling, Wolfwood shot, killing not only Zazie but the boy he was controling. this lead to Vash and Wolfwood having arguments. the next Gung-ho Gun to appear was Caine the longshot. Caine the longshot was elendire's replacement for the anime, so Caine is the only gun that appeared in the anime that did not appear in the manga. he carries a large sniper rifle with a barrel that extends to nearly 50m, he is also able to camoflage himself so he himself is not noticed. he was found by Vash because while Vash was avoiding the gun fire he judged the angle and the time between each shot. after destroying Caine's rifle, Vash told him to just go home and think. not wanting to face the death that Knive's had planned out for him, caine shot himself then and there. Vash then proceed to bury Caine's body and walk back in tears. the next gung-ho gun to appear was Chapel the evergreen. Chapel the evergreen is/was Wolfwood's mentor, he tought wolfwood how to shoot and the code that they lived by. he wears dark green clothes and has red goggles crafted to his face. Chapel carries the parent version of Wolfwood's punisher, the large cross gun the wolfwood carries around. Chapel's punisher splits in half to form two machine guns. at the start of the episode, under the command of knives, chapel made wolfwood an horourary member of the gung-ho guns. Chapel fought wolfwood at the same time that Vash was fighting caine the longshot. Wolfwood did defeat Chapel but did not kill him, chapel even admitted defeat. once wolfwood's back was turned, chapel was possesed by the Gung-ho gun's leader, Legato Bluesummers (will talk about him later). once Chapel was under Legato's control he shot Wolfwood. Wolfwood then carried his cross shaped punisher into the nearest church and died after making a confession (I hate this ep cause wolfwood is one of my fav characters ). Chapel then returned to legato's and knive's hideout, he then tried to kill legato but was possesed again. knives then killed chapel for trying to betray him. Bozo you never really said what language it is. the next gung-ho gun to appear was Midvalley the hornfreak. Midvalley is a musician that can use his saxophone to synchronise sound waves with pain, causing physical damage. hidden inside the saxophone is an 8 barrled machine gun. Vash is was able to damage the saxophone with a ricochet shot, making midvalley resort to the machine gun, but with the gun barrels damaged as well, the saxophine exploded in his hands and killed him. Midvalley was the final Gung-Ho gun in the anime. fang, livio only appeared in the manga and was a childhood friend of wolfwood. orphanage, we last see him paying respects to wolfwood’s grave.